The above diagram illustrates this simple procedure. An incision is made in the gum tissue to expose the bone and surrounding inflamed tissue. The damaged tissue is removed along with a small amount of the root tip. 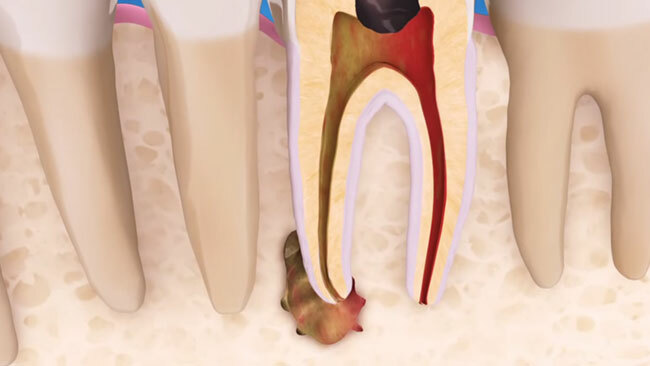 A root-end filling is placed to prevent reinfection of the root and the gum is sutured. The bone naturally heals around the root over a period of months restoring full function. Following the procedure, there may be some discomfort or slight swelling while the incision heals. This is normal for any surgical procedure. To alleviate any discomfort, an appropriate pain medication will be recommended. If you have pain that does not respond to medication, please call our office. We routinely see our surgery patients for a post-surgical check two weeks after surgery, and then again in six months for a recall examination.